The 2018 Verizon IndyCar Series entry is coming into focus with the release of new images of the planned design of the car. INDIANAPOLIS – The design of the car to be used in Verizon IndyCar Series competition in 2018 is coming more into focus. IndyCar, sanctioning body for the premier North American open-wheel racing series, released new images today of the universal aerodynamic bodywork kit that will be used by all competitors in 2018. 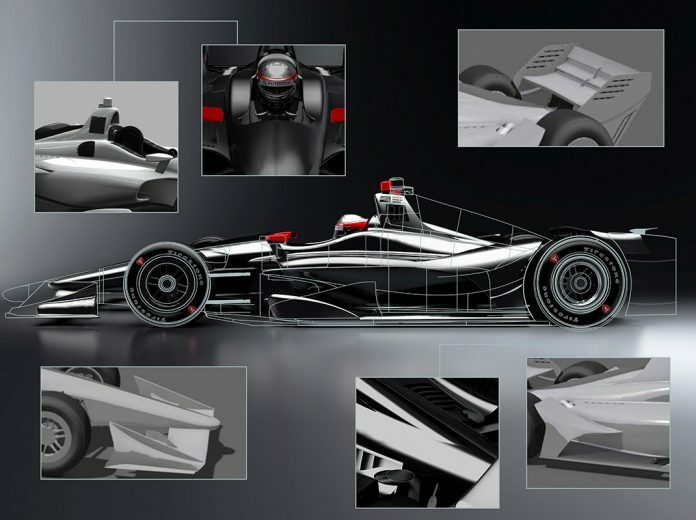 Following along with this year’s IndyCar theme of “NEXT,” the computer-generated images are the next evolution of the car’s development process and provide more detail than concept sketches released in January. Frye said IndyCar is on target to begin testing the car by mid-summer. Verizon IndyCar Series teams will still choose between Chevrolet and Honda engines for competition next season, but all cars will be outfitted with the universal kit that covers the Dallara IR-12 chassis that has been used since the 2012 season. As with the current aero kits provided by Chevrolet and Honda through the end of this season, the universal car will come in two configurations: one for superspeedway ovals and the other for street courses, road courses and short ovals. The supplier of the universal kit has yet to be announced, but its look is sleek and reminiscent of past Indy car favorites. Tino Belli, IndyCar director of aerodynamic development, said the kit has been successfully reverse-designed to start with its desired appearance and build in functionality from there. “We’ve been working on the aerodynamics to suit the look, rather than the other way around,” Belli said. A key component of the new car is for it to generate most of its downforce from underneath instead of on top. This will improve racing and passing opportunities by decreasing the turbulent air that the Indy car leaves in its wake. Belli added that simulations show the new car meets IndyCar’s aerodynamic targets and additional safety enhancements include side impact structures in the sidepods and repositioned radiators to assist in reducing the severity of side impacts by crushing on impact. Other noticeable features in the new car images include a lower engine cover that provides “a more traditional Indy car look,” according to Belli. Turbocharger inlets are moving to the inside of the radiator inlet ducts. The rear wing and front wing main plane are smaller in the new car look and the centerline wicker from the nose of the car to the cockpit is tapered. The rear wing in the road course/short oval configuration is lower and wider. The fins on the leading edge of the sidepods of the current car will be removed or minimized on the 2018 car. Though there is still work to be done, Belli feels that IndyCar has achieved “97 percent” of its goals when it set out to create the new car’s look and efficiency.